MIO by the Covo Tiny House Co. Designed for the person that works from home. This tiny house features a sit/stand desk, integrated smart home lighting, heating & security. At one end of the house is a 55-inch monitor and 2.4 amp USB ports can be found throughout the home. The kitchen is larger and more functional than many tiny homes, plus there’s plenty of storage. To learn more visit the Covo Tiny House Co. website. 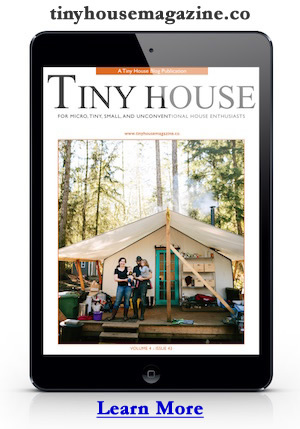 This entry was posted in Tiny House Projects and tagged Covo Tiny House Company, MIO. Thanks for including the plan! That clears up mysteries that might not be answered by the photos. I love the simplicity and the finishes. It looks durable but relaxed. Open, but some clever storage. Nicely done! This is a lovely plan. How much would it cost to build this house? Happy to hear you like it. This was built last month as our model house with a lot of upgrades (all walnut butcher block counter tops, premium vinyl flooring, all LED lighting, 7′ x 3′ awning window, fully smart enabled with Echo and Wink, 9,000 BTU minisplit, composting toilet, etc), so it’s going to be a little more expensive than our standard one. This one was coming in at the low $80s, but our more standard homes will be start at $60K. Visit our website to see more about us!